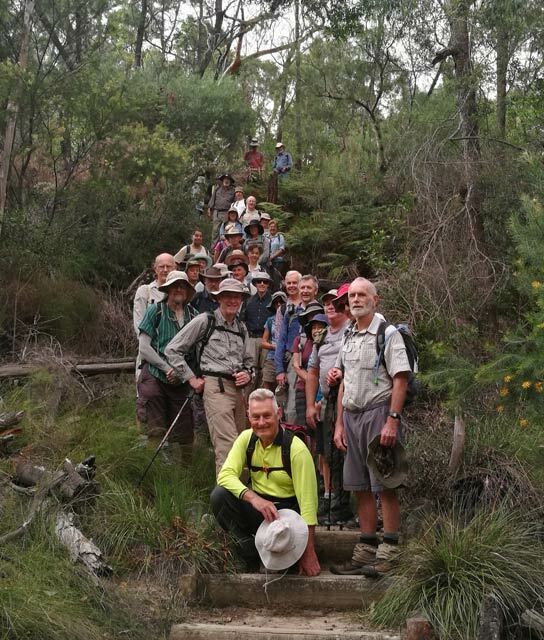 We’ll take the Two Creeks Track briefly then divert northwards and walk on the stepping stones over Gordon Creek to the edge of Killara. Then we follow the western bank of Middle Harbour Creek to Lockley Point to follow the Lockley Track passing Speakers Rock before negotiating the possibly slippery crossing of Rocky Creek. 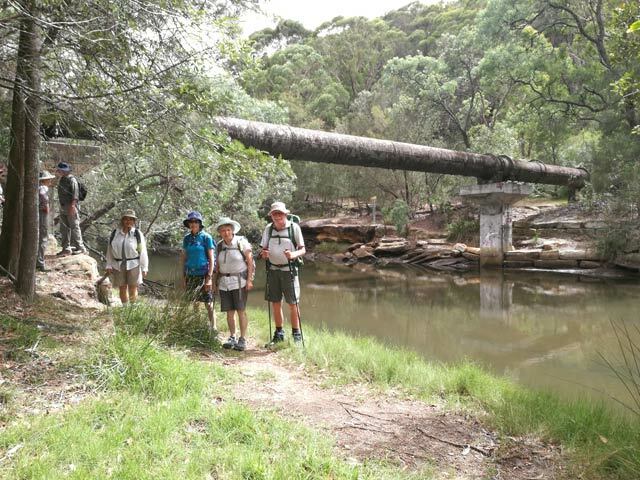 Shortly afterwards we’ll walk under the Pipeline and eventually cross Middle Harbour Creek at Bungaroo. 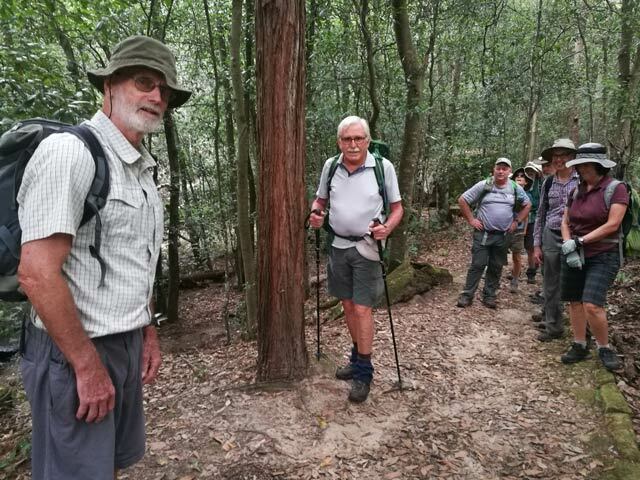 Then we’ll follow the Harbour to Hawkesbury Track to the Cascades then take the French’s Creek Track to Glenrose Shopping Centre – refreshment opportunity. Exit via bus to Chatswood, City, or Manly. The large crowd could be attributed to a cooler day (at 26 °C max) than lately, no other walks on the program, and it being an 80L walk. It was good to see Warren Southey back on the track after having surgery on his hip. 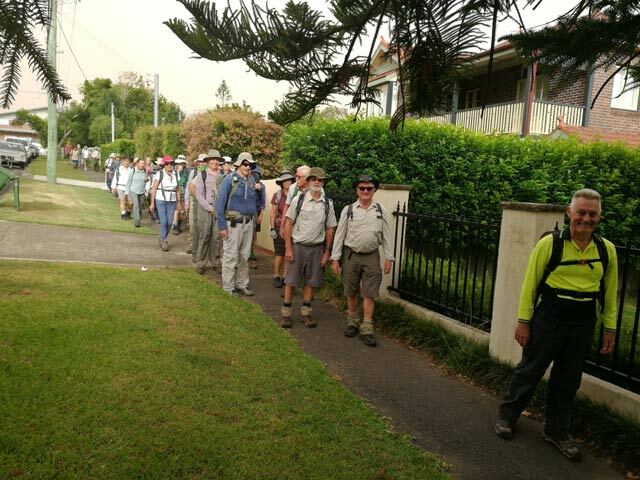 As our large gathering blocked the concourse at Lindfield Railway Station while they signed the Sign-On sheet we moved down to the top of Tryon Road for the Welcome Circle. After the Prospectives and Guest were introduced John Booth offered to be Tail, as being an ex-Head Master he could be relied on to count up to 37. 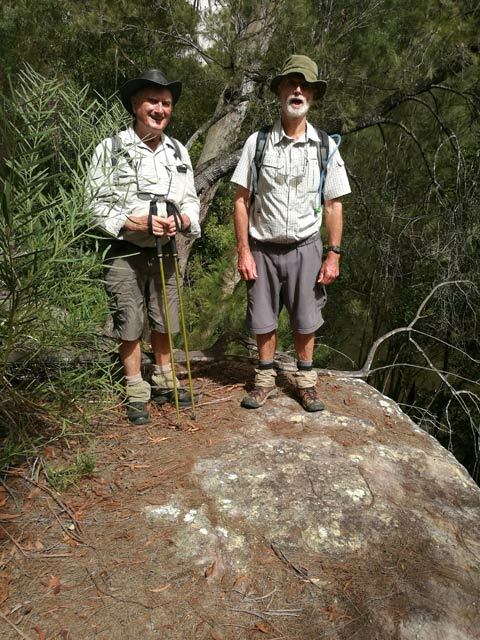 We then walked down Tryon Road to the start of the Two Creeks Track. 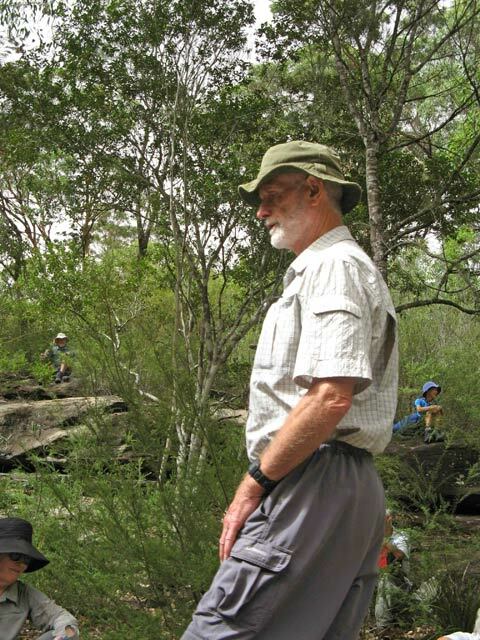 Shortly afterwards Warren Southey showed us the tree root which triggered his fall. A photograph was taken by Steven Sim for posterity. It was quite dark in the tunnel under Arterial Road so Kevin Yeats’ torch was useful to illuminate the water we had to cross to get to the footpath. There was no trouble crossing Gordon Creek on the stepping stones as I had deliberately chosen the walk to coincide with low tide. When I first did this walk there was about 5 cms of water above the stones. It was then realised that the walk was ‘tide dependent’. We walked beside Gordon Creek to the information signs where the old walk bridge had been. Then followed a narrow track before turning left (northwards) along another narrow track. This brought the upper reaches of Middle Harbour on our right-hand side. 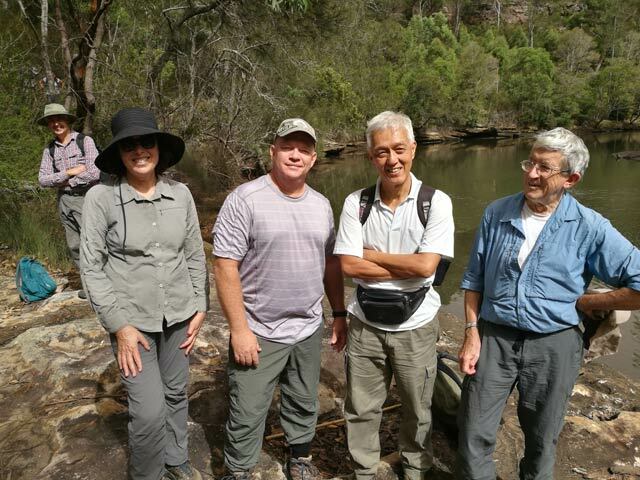 We stopped for Morning Tea where there was a rock shelf near to water level. There were grumbles from those who unfortunately were bitten by bull ants! 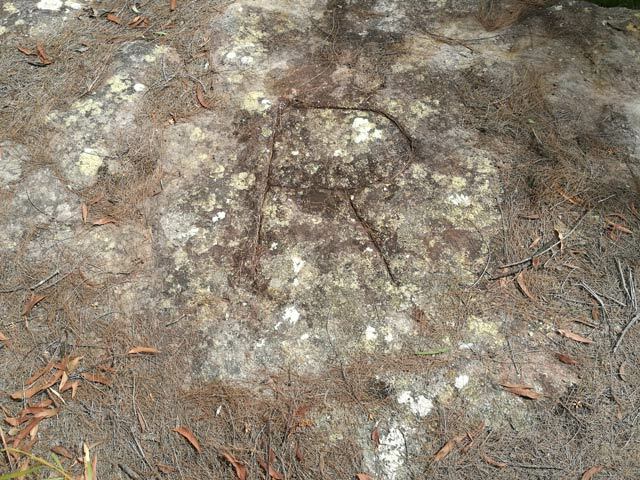 Further along we paused at Speaker’s Rock – with the letter R carved in it. 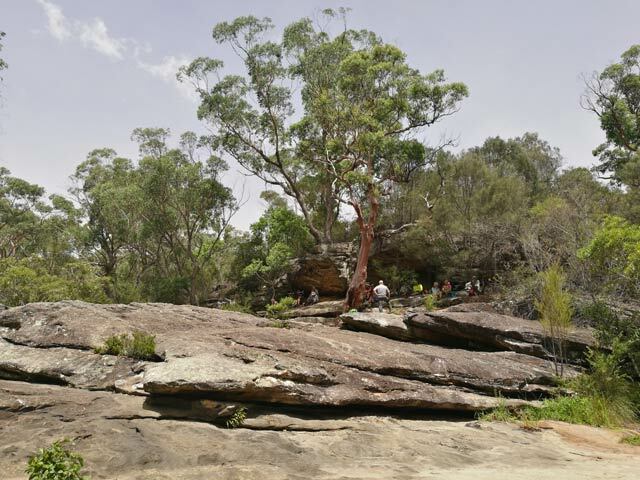 This was where the Sydney Rostrum Club was founded on 21 July 1930 under an angophora tree. Their motto is ‘Not to be silent when I ought to speak’. 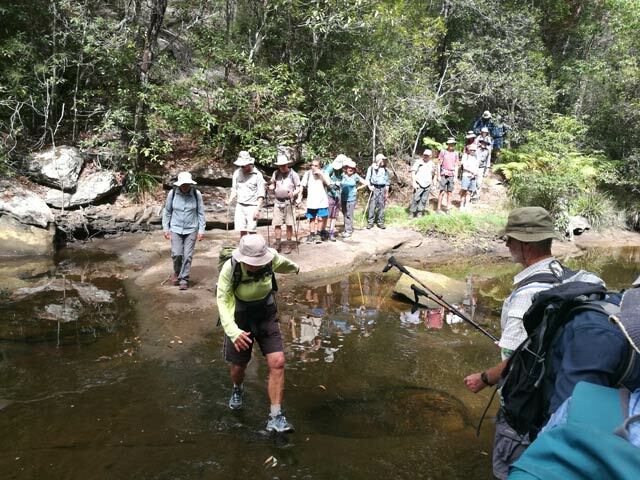 Shortly after we all safely crossed the potentially slippery Rocky Creek – with the help of poles lent by Noely Rathborne. 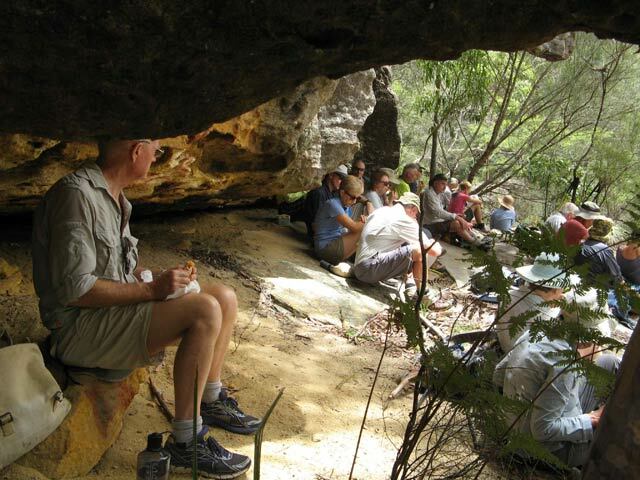 Then under the Pipeline and up to Bungaroo where we crossed over to the Governor Phillip track which led us to the Cascades where we stopped for lunch. 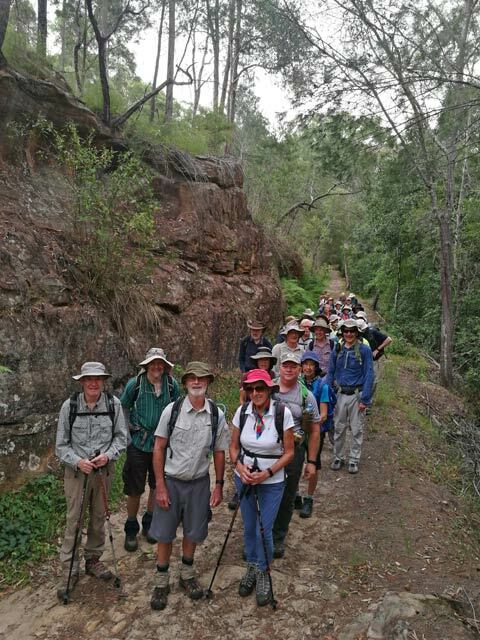 Then we followed the French’s Creek track to Wanniti Road in Belrose and from there a short walk to the Glenrose shops where refreshments were enjoyed by most. During the walk we spotted some Brush Turkeys and Water Dragons. No snakes though – like I saw during my Recce the previous Friday.